at Eight on the Break Arcade, Dunellen, NJ. The JPA PinGolf Tournament is WPPR certified! 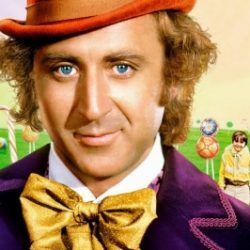 World Pinball Ranking Points based on how well they finish. 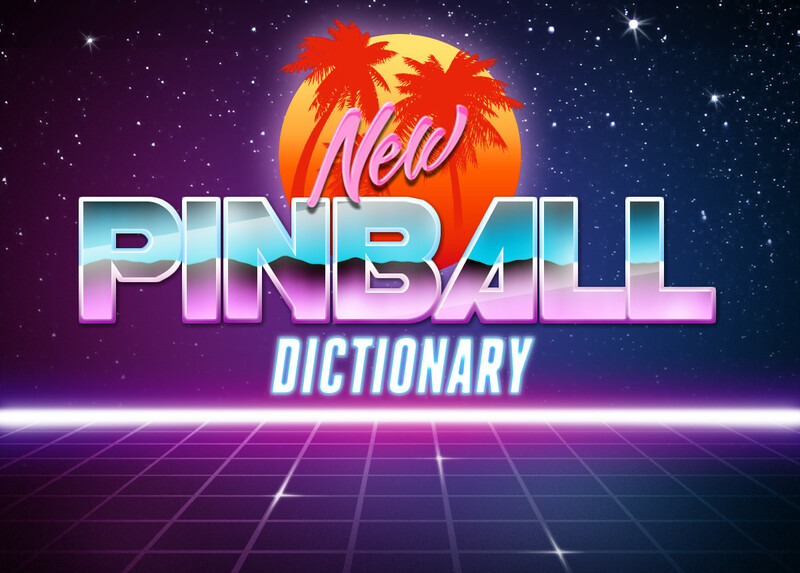 You can be ranked among the best pinball players in the world! Target Scores: These games have been at Eight on the Break and may be used in the competition. 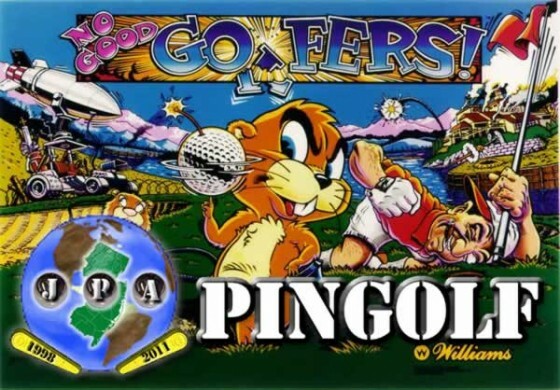 Players choose five of the available games to form a PinGolf entry. Nine of these games listed below are currently available at Eight on the Break Arcade. 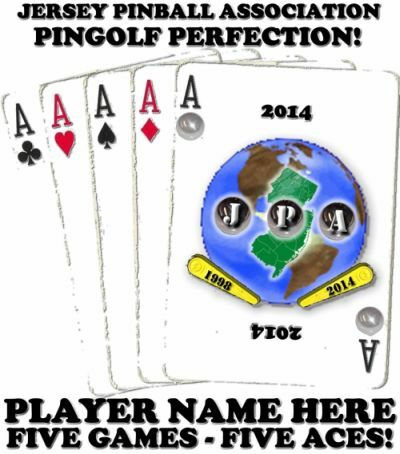 a personalized “2014 JPA PinGolf Perfection” T-Shirt! Limit of one “Five Aces Prize” per player. Your first entry is free! All league members will receive their first JPA PinGolf entry free. Your free entry must be the first entry used. You have until the end of the PinGolf season to use your free entry. If you do not complete your free entry, you will simply be tied for last place with the maximum score of 35 Pin-strokes. 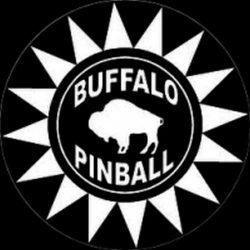 The JPA PinGolf Tournament is a season long competition where players attempt to reach target scores on a number of pinball machines using as few balls as possible. Players may attempt to complete PinGolf entries as many times as they wish, until one-half hour before the start of the JPA PinGolf Finals. 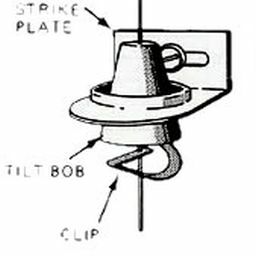 This is to allow time to complete any necessary tiebreaker Pin-Holes after the qualification time has expired. Each PinGolf Tournament attempt/scorecard requires a $5.00 entry fee. All proceeds from scorecards will be added to a PinGolf Prize Pool which will be awarded at the Final. Players may need to insert coins before playing a machine. The cost of playing each game is in addition to the PinGolf entry fee. The 3 players with the lowest Pin-Stroke total will qualify for the PinGolf Final. The PinGolf Final is a 3-Player playoff round using 5 of the available PinGolf games. The PinGolf Final will use a random selection of 5 of the available games, one at a time. You never know which games you will play in the Final so be ready for any of them. Scores are cumulative for Qualifying and Finals. Ties will be decided by sudden death Pin-Hole(s). Any sudden death tie-breakers will occur on 1 randomly selected game. If there is still a tie after the first sudden death Pin-Hole, another game would be randomly selected and so on. The PinGolf Final will occur after the end of the JPA League season. For each Pin-Hole in the Final, the player who is currently in third place will go first, the player in 2nd place will go second, and the player in the lead will go last. The order of play can change after each Pin-Hole depending on players’ current scores. The player who is going first can decide whether to play the game in tournament mode, if available. The same player cannot win more than one prize. Only a player’s best Pin-Stroke total will be used. Payouts: 1st – 60% of Prize Pool, 2nd – 30%, 3rd – 10%. A player can select any 5 available games that the have a target score to form their PinGolf entry ticket. The player selects their first game, plays it, and then when they are finished, selects their 2nd game and so on. Players are not allowed to pick the same game twice on one ticket. Once a game is selected, the player must use that game as part of their entry. Players are allowed to attempt games in any order they wish. Players do not have to attempt all games consecutively. Players may attempt games on separate occasions. Players may not “buy-in” extra balls. If it takes multiple games to reach the Target Score, the scores from the additional games will be added to the scores from previous games. There is a course maximum of seven Pin-Strokes per hole. Should a player not reach the Target Scoreafter six balls, record a score of seven. Any unfinished Pin-Holes will also receive a score of seven. After passing the target score on a game, the player should notify a PinGolf official as soon as possible so the official can record the proper number of Pin-Strokes. After finishing the PinGolf course, a player may purchase another scorecard to try to improve their score. Extra balls may be played, and do not count as an additional Pin-Stroke, but as a continuation of the current ball being played. 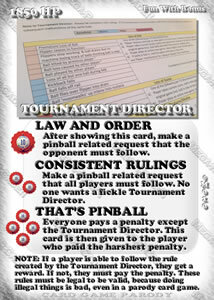 Except for the special case stated below in “Malfunctions“, players may only play one PinGolf entry at a time. Before starting a new entry, the player must either finish or void their current entry. It is ultimately the player’s responsibility to notify a PinGolf official when they have passed the target score. Games may be played on normal, non-tournament settings. All extra balls may be played and do not count against the player’s stroke total. If games are replaced during the season, the PinGolf Tournament officials will assign a target score for the new games. All previous PinGolf Tournament scores remain in effect. The game must be in working order to attempt a Pin-Hole. Working order means that a game operates well enough that it would be made available for League play. Note that this does not mean the game needs to be in 100% perfect condition. Demolition Man – To complete a valid attempt in the game Demolition Man, either the claw must be disabled or the player must use each claw award once each lap with no repeats. Additionally, the Lock Ball award must be selected first. For example, once a player has taken the Lock Ball Award, the player cannot choose Lock Ball again until they have collected Demolition Time, and started a new lap of claw awards. Failure to follow these rules will result in a penalty stroke for each occurrence. 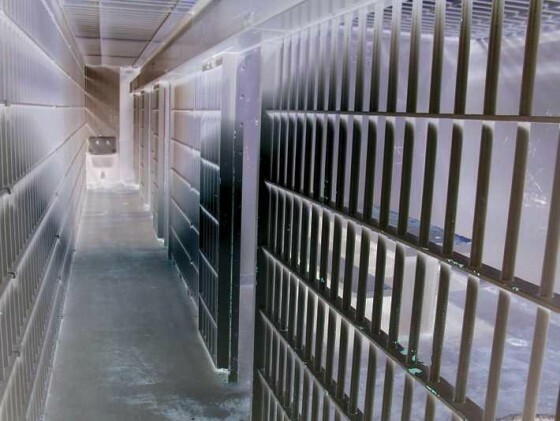 No Good Gofers – The left ramp/lock shot offers no compensation for making the ramp shot when the left lock is lit. If this should happen, play on. The player should aim to do something that will make “Bud” pop up again so that he will leave the lock shot open. The right ramp does give compensation for making the ramp shot with the right lock lit, so there is no ruling needed in this case. Terminator 3 – Because of this game’s notorious FLASH/RESET glitch, games played on T3 will be watched as closely as possible. If the player’s score can be discerned/estimated when the glitch happens, then the player will continue on a new game using the score and ball count up to that point. If the player’s score cannot be discerned/estimated when the glitch happens, then the game must be restarted from scratch. Any score brought forward from a previous T3 game will still count. Example 1: A player scores 23 Million on game #1 of T3. The glitch happens on game #2, and a PinGolf Official is able to determine that the player had approximately 17 Million while on ball 2 (which is the 5th ball total out of the maximum 7). The player would start a new game with a score of 40 Million and would still be on ball 5 out of 7. Example 2: A player scores 23 Million on game #1 of T3. The glitch happens on game #2, and a PinGolf Official is unable to discern/estimate the player’s status on that game. The player must start a new game #2, continuing with the 23 Million they got on the first game. tl;dr – You play Terminator 3 at your own risk. Reasonable rulings will be made. Avengers – This game has been set to 4 balls per game. However maximum stroke count for the game remains 7 just like any other JPA PinGolf game. If a player does not reach the target after 6 balls, they will receive a 7 and can stop playing. 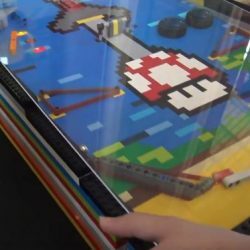 Once a game is selected, the player must use that game as part of their entry even if something happens (ball stuck/game broken) that prevents the game from being completed. In this case, the player’s progress up to that point is recorded, if possible. Then, the player can continue with the rest of their entry, leaving the problem game unfinished. A player may select a game that is at Eight on The Break, has a target score, but is unavailable/broken as part of their entry and then start a new entry. Once the problem game is fixed, the player must then complete the previously unfinished entries in the order they were purchased. Exception #1: If a game selected at Eight on The Break is unavailable/broken and then removed from the location, the player may select another game to replace it. Exception#2: If a game selected at Eight on The Break is unavailable/broken and has no chance of being repaired, the player may select another game to replace it. Normally, players are only allowed to have one PinGolf entry outstanding at a time. However, in these cases, the player may choose to purchase and start a new entry instead of having to wait for the game in question to be available/fixed. Tournament rulings regarding machine malfunctions will be guided by the PAPA and IFPA rule sets, however the ruling of the PinGolf Official is final. Normal Tilts will result in a loss of ball in play only. The player may continue the attempt as normal. Slam Tilts result in a loss of all remaining strokes in that game. The player may continue the attempt as if all balls were used in the previous game. Bang Backs and Death Saves are explicitly disallowed. A player who performs any of these illegal moves will have their entire entry voided immediately with no refund. Other tournament rulings regarding player conduct will be guided by the PAPA and IFPA rule sets. During the PinGolf Final or Tie-breaker, a competitor who plays out of turn will be assessed a penalty stroke for the infraction. If the ball was not lost during the infraction and the offended player regains control, the offended player may chose to continue the game as normal or play a new game alone. If the ball was lost during the infraction, the offended player may chose to continue the game with one stroke deducted to account for the lost ball, or play a new game alone. The offended player may have to start and take a ball from another game to account for the seven stroke maximum. Tournament rulings regarding machine malfunctions and player conduct will be guided by the PAPA and IFPA rule sets. Decisions of the PinGolf Tournament Official is final. This rule sheet may be amended if warranted.